The Care Inspectorate in Scotland have produced a report on Equal Play for children. 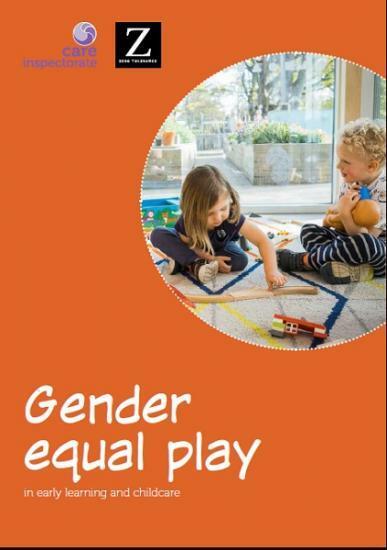 The report is part of a campaign to encourage and positively promote gender equal play in early years settings. In partnership with charity Zero Tolerance, they have published a new resource for people who work in the early learning and childcare sector. The resource is full of practical, easy-to-follow advice and information, and aims to boost services' awareness of the positive benefits of encouraging and supporting gender equality from an early age. Children's experience of childhood and play is becoming more gendered and polarised between girls and boys, with products such as toys, books, online resources and clothes increasingly being produced and marketed along gender lines. Academic research, including the work of Dr Nancy Lombard from Glasgow Caledonian University. Highlights the negative impact on all children of gender stereotyping and the important role that early learning and childcare (ELC) can have in positively promoting gender equality. This resource has been co-produced by the Care Inspectorate and Zero Tolerance in order to help practitioners enhance gender equality for children across all ELC settings. As part of this collaborative project, we worked in partnership with other organisations including Play Scotland, Education Scotland, NHS Greater Glasgow & Clyde Health Improvement and the Scottish Childminding Association. applies to all public services in Scotland. While most people agree that gender equality is a good idea, within ELC services there is a need for advice and guidance for practitioners on how to support gender equality and avoid harmful stereotyping in their practice. The resource therefore offers practical and helpful tips on how to promote gender equality in an accessible way. As well as sharing practice examples from a range of different settings, we also advise on other practice resources available to services, such as children's books, toys and activities, training and further reading.